I’ve been playing with a few new undereye concealers over the last month or so, and I definitely have a clear favorite. But before I delve into which one made the cut, I want to go into how and why I use concealers. It seems a little complicated, but to me, if the “foundation” of your makeup, i.e., your skin, isn’t right, then it doesn’t matter what you put on top of it. So it’s worth it to me to spend a little more time (and money and effort) on the beginning steps in order to get the final effect I want. First of all, I use two different kinds of concealers-one for under my eyes, and one for blemishes on the rest of my face. The reason for this is that I want to brighten and/or highlight under my eyes, and I most definitely don’t want to do that to my blemishes! Also, the skin is different under my eyes-it’s drier and thinner than the skin on the rest of my face. So, two different concealers, and in this case, two different formulas and colors as well. I also do an extra step under my eyes. BEFORE I conceal, I correct. I ALWAYS pat in a layer of Mac Prep+Prime Highlighter in Radiant Rose, which is a peachy toned liquid, on the inner corners of my eyes where I get the most darkness. 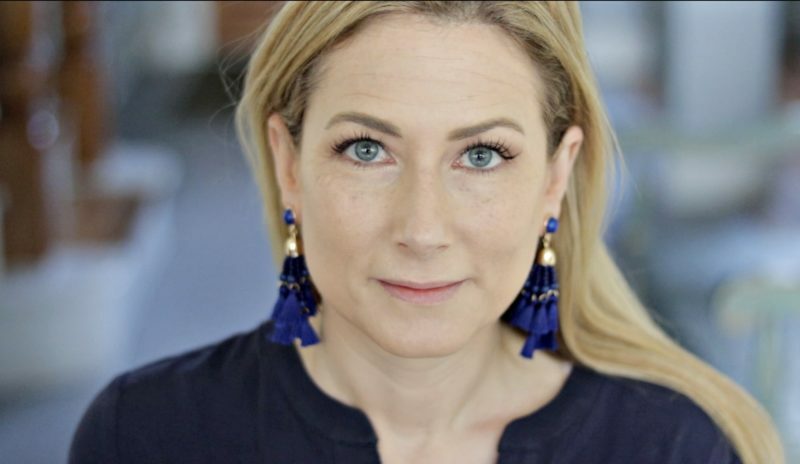 Once I’ve corrected the blue tones under my eyes with a corrector, then I conceal, or in this case brighten with an undereye concealer that’s a shade or two lighter than my skin tone. Since I’m very fair, it has always been a bit of a challenge to find a concealer that’s light enough to add that brightness!! And just to be clear, I put on my makeup in this order: moisturizer, eye cream, foundation, corrector, concealer, powder, contour, bronzer, highlighter, blush…then on to the eyes. But for the purposes of this post, I’m skipped the corrector so you can see how the concealers stack up when they’re working on their own! I should also point out the type of skin I have, because everyone’s skin is different, and what works for me might not work for you. I have generally dry skin, and while it is considered “mature” (I’m almost 44), I’m pretty blessed as far as fine lines/wrinkles go. I have some, but not too bad under the eyes. 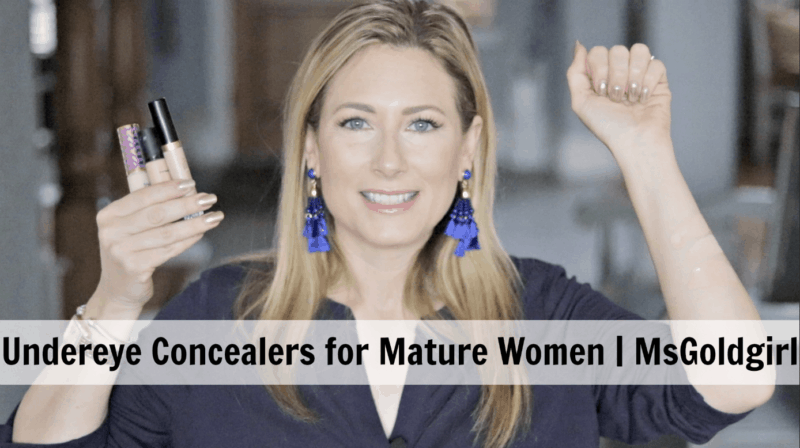 So while this post is geared toward the “mature” lady, I think my findings can be helpful for any age range, if your skin type and what you’re looking for line up with me! First up is the Too Faced Born This Way Naturally Radiant Concealer. It comes in 10 shades and is priced at $28 for .23 ounces. It comes in a clear plastic tube with a doe foot applicator wand. The description on the Too Faced site says it contains hyaluronic acid and coconut water so it also has skincare properties, and it’s supposed to blur imperfections. I got it in the shade Very Fair. I didn’t even bother taking pictures of what it looks like under my eyes…I have it in the lightest shade and it still too dark. When I wore it I also found that it never really set and that it creased after a matter of hours. So this was a no go for me! The next one I tried was the Mac Pro LongWear Concealer. It comes in 16 shades and is priced at $22 for .3 ounces. It is packaged in a clear glass container with a pump dispenser. It claims to be sweat proof and waterproof, which I did not test. I bought it in the shade NW15, which I think is too pink for me, and may be part of the problem. This was also not a total favorite, although it has potential. I’m really not a fan of the packaging. I know too many people who have dropped the container and had it shatter all over their bathroom floor. I also don’t care for the pump dispenser-too much product comes out and you really don’t need a lot to do the job. Also, it does a pretty good job of concealing, but I don’t think it blended well into my skin and foundation as well as I would have liked. I think that once I get over the packaging issues and get a better shade match, I may end up loving this concealer, especially once the hot Texas summer kicks in…somewhere around mid-March! 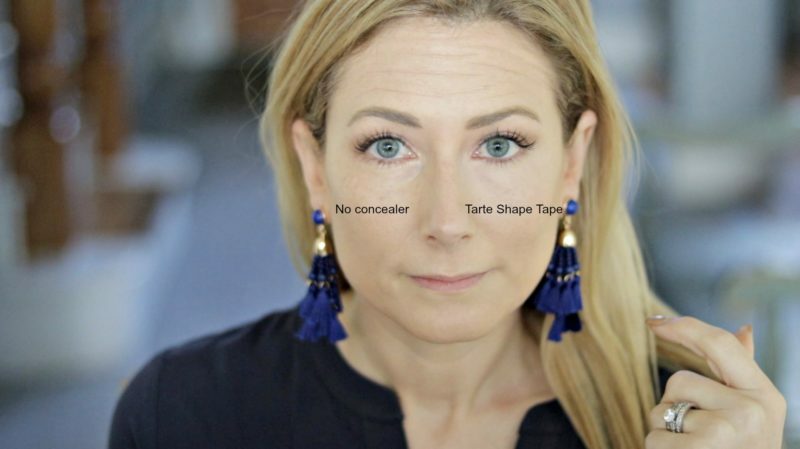 The last one I tried, and the clear favorite for me, is the Tarte Shape Tape Contour Concealer. It comes in 14 shades and is priced at $24 for .34 ounces. It’s packaged in a clear plastic tube with a large doe foot applicator. I got it in the shade Fair. The reason it was the last one to be tried is because it is REALLY hard to find. It’s carried in stores at Ulta, but unless you are a deeper skin tone, they never have it in stock. I have had luck lately finding it online at Tarte Cosmetics, and you can also find it online at Ulta, QVC, ShopSpring, but it’s not always in stock there either. Here are my reasons for this one being the winner: It is the most pigmented, so it really covers any discoloration and darkness. It doesn’t crease, especially if you set it with powder, so that’s pretty important. It comes in a shade that’s actually lighter than my very pale skin, so it brightens too! 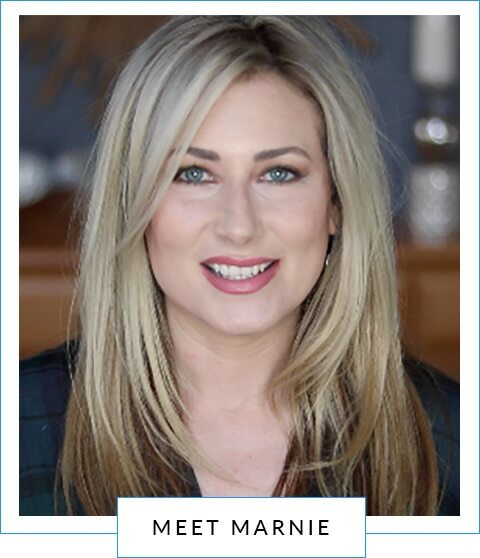 Finally, despite how pigmented it is, it does NOT accentuate any wrinkles or fine lines. The key to working with the Shape Tape is to pat, pat, pat it in until it is completely blended into your skin. I use a combination of a kabuki concealer brush and my finger, but I think a slightly damp beauty blender would be a good option as well. I’ve also found that it works best if I set it with a powder, and I’ve been alternating between the Guerlain Meteorites and the yellow powder from the e.l.f. contour palette. There’s no rhyme or reason for why-just whatever I feel like! I know I’ve bombarded you with a lot of words, so here are some pictures to show you what they look like compared to one another! First, let’s have a look at me without any concealer on at all-although I am wearing foundation and eye makeup. I’m not sure what’s going on with my facial expression, but in the picture above I’m wearing Tarte Shape Tape on the right. I think my skin looks flawless, and we can see in the first picture that it’s not! Here I am with both concealers on, and I think you can see that the Mac Pro LongWear isn’t blended as well with the rest of makeup, and it’s not for lack of trying! 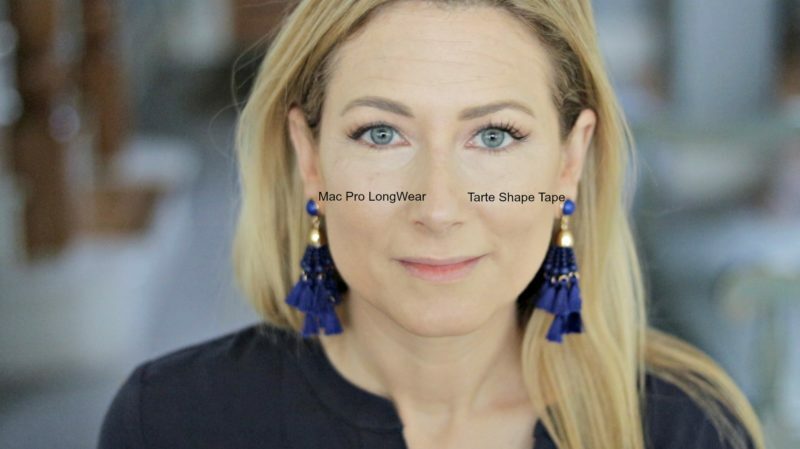 So for now, my new favorite undereye concealer combination has to be the Mac Prep+Prime Highlighter in Radiant Rose with the Tarte Shape Tape Contour Concealer on top. And in case you’re wondering, I’ve been using the Cle de Peau Beaute Concealer on the rest of my face for blemishes and discoloration. However, I know the price tag is a bit steep, so I’m on the look out for other options for you as well!! Stay tuned for another concealer comparison! If you’d like to hear me talk through this and see a demo, please watch the video too! Hi Marnie! Thanks for this review. I’ve recently tried to find an under eye product (not having tried any of the ones you show here) but have felt that they accentuate my fine lines to the point that I don’t even put foundation under my eyes. Am I doing something wrong? Or just using the wrong type of product? I know Ulta will take back a product if it’s not satisfactory so maybe I’ll try the Tarte but if you have any tips I’d really appreciate it. Thanks! Well, are you moisturizing with an eye cream? And are you fully blending and patting in the concealer and/or foundation? Those are key things to getting it right. Also, it sounds counter-intuitive, but powder does help prevent creasing!